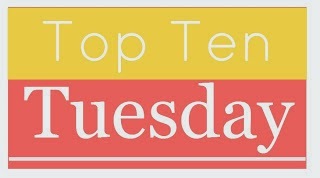 Welcome back to another Top Ten Tuesday! October 25: Halloween related freebie: ten scary books, favorite horror novels, non-scary books to get you in the Halloween/fall mood, bookish halloween costumes, scariest covers), scary books on my TBR, etc. Honestly? I’m not that into Halloween. I love handing out candy and seeing kids come to my door dressed in costume. But really? That’s about it. I know some people just love this holiday and go all out. It’s just not me. Which makes this week’s topic a little eh for me. I do love books with witches, but I used that as my Halloween freebie last year. However, I don’t want to skip another week either. I missed the last two TTT (I didn’t have a lot of time to work on them, and couldn’t think of a full post off the top of my head), and I don’t want to make it three in a row and strike out. Peeves, Harry Potter series by J.K. Rowling. Truly, the Harry Potter series could fit many of my Halloween Awards. Since I don’t want one book to dominate, Harry Potter gets to take home best poltergeist. Because who beats Peeves? Nobody. Diana Bishop, A Discovery of Witches by Deborah Harkness. I loved, loved, loved this first outing with Diana Bishop. Gandalf, The Fellowship of the Ring by J.R.R. Tolkien. This may be the only time that you will ever see a Lord of the Rings book in my Top Ten. I’m really not a huge fan. (I know! I know! Most people love the series.) But Gandalf is pretty awesome. Lestat, The Vampire Lestat by Anne Rice. Technically, this is the second in the series (you really start with Interview with the Vampire), but this is the first from Lestat’s point of view. After I read this book, Lestat became my favorite vampire, hands down. And here, 20 years later, he still is. It by Stephen King. Truly, this is the scariest book I have ever read. My Dad started reading It when I was in high school, and was scared to turn the light out or go downstairs to take the dogs out late a night. I told him there was no way a book could be that scary, and he challenged me to read it. He was right. It’s the Great Pumpkin, Charlie Brown. I love this classic. Poor Charlie Brown gets rocks every year, and Linus misses all the trick-or-treating fun waiting in the pumpkin patch for The Great Pumpkin to appear. Graves End: A True Ghost Story by Elaine Mercado. I read this book about five years ago, and for me it was pretty unsettling. I should note that I have not read (and probably never will read) The Amnityville Horror. I’ve heard the basics, and if that is a true story, holy cow. I would give myself nightmares reading about it. Charleston, South Carolina. The first time we visited, my husband and I went on an evening walking Ghost Tour, where we were treated to many ghost stories. You know in a town with this much history, there’s got to be a few specters hanging about. I’m still waiting to have a brush with the dog Poogan, we eat at Poogan’s Porch every time we visit. The Stanley Hotel in Estes Park, Colorado. Hands down, the creepiest. This one does have a book tie-in – Stephen King was inspired to write The Shining after a stay at The Stanley. I’ve been inside the hotel a few times, and honestly I don’t know how people stay there. Just the public areas downstairs give me the creeps. The Melting Pot in Littleton, Colorado. The Melting Pot building has quite a history, having been both a library (book tie-in!) and then a police station. Locals swear it’s haunted and it’s fun to get a chatty waiter who will share some of the after hours experiences he has had. Supposedly there is a ghost in the women’s bathroom but I’ve always been okay. We’ve had some girls nights out at the Melting Pot, and a few of my girlfriends who won’t go in the bathroom by themselves. Good thing women always go in a pack. There’s safety in numbers. As I was writing, I realized my list moved from fiction to non-fiction. I started thinking about locally haunted places after I put in the non-fiction ghost story. These places always fascinate me. In the daytime, of course. What did you pick this week for your open-ended Halloween list? Do you have a favorite local spot that has rumors of hauntings? Sound off in the comments below and link up to your own TTT if you’ve got one. What a fun way to do this topic! I loved it! Lestat was a great and unexpected choice! Ugh….I’ve seen It on a few lists this week, but I just don’t think I’m brave enough for a scary murderous clown….!!! Oooh, interesting about The Melting Pot in Littleton! And Poogan’s Porch, for whenever I finally visit Charleston. I think I can top your Stanley Hotel, which until a couple years ago was the only “haunted” building I’d ever been in. When we lived in Ohio we visited the Mansfield Reformatory, where some of the movie “The Shawshank Redemption” was filmed. I’m a party pooper and don’t believe in ghosts, but the state of total disrepair, the electric chair on display in the lobby and the long-uninhabited feeling definitely make it eerie. I was most unsettled by the giant tiled shower room where I’m sure all manner of atrocities happened. I can easily see why the place is favored by ghost hunters! Anyway, this was a super-fun take on this topic! I give Harry Potter the award for Best Halloween Portrayal. I just want to jump right in and enjoy the Halloween feast under the enchanted Great Hall ceiling while ghosts and bats flit about. What a great take on today’s topic! I like Halloween and always mean to make a thing of it but somehow never quite get there. It sounds terrifying! I want to try Stephen King but I’m thinking that It is not the one to start with! I second IT. That book gave me nightmares, and left me with a stutter until I completed it. I can’t wait to see the remake so I can compare it to the Tim Curry version when it’s released. Another scary King book for me was Salem’s Lot. This is a fun list! I wrote about top authors to read for Halloween. Stephen King and IT were at the top of my list! I like the idea of haunted places. I’ve never been to the Shining hotel but I’ve been to a lot of battle sites and some of them feel pretty haunted. Yay for It’s The Great Pumpkin! I love that show so much. I’m not a huge fan of Halloween either, but that movie totally makes the season for me.